LANCASTER – A 47-year-old man suspected of stealing thousands of dollars’ worth of equipment from local construction sites was arrested Tuesday, authorities said. Wayne Willis was arrested around 10:50 a.m. after deputies raided his Lancaster property and found nearly 100 pieces of serialized construction equipment, some of which had altered serial numbers, according to Lancaster Community Relations deputy Miguel T. Ruiz. 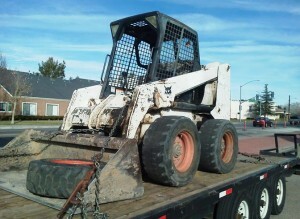 This Bobcat skid-steer loader was equipped with a LoJack, and deputies tracked the signal to Willis’ Lancaster home. One of the items, a stolen Bobcat skid-steer loader, is what led deputies to Willis, Ruiz said. He said the Bobcat was reported stolen Tuesday morning from a local construction site near 20th Street West and Lancaster Boulevard. The item was equipped with a Lojack system, and deputies tracked the signal to a Willis’ home in the 44000 Block of Cedar Avenue in Lancaster, Ruiz said. 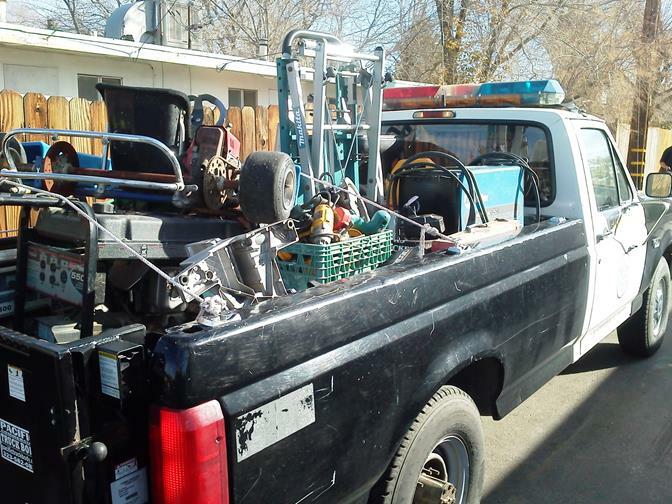 They executed a search warrant at the property and confiscated nearly 100 pieces of construction equipment and other items believed to be stolen, Ruiz said. Deputies also seized motorcycles and off-road vehicles that were not registered to Willis. “Several generators, several circular saws, drills, an air jack hammer… It was pretty much a broad spectrum of construction equipment and heavy equipment that would commonly be used at a construction site. 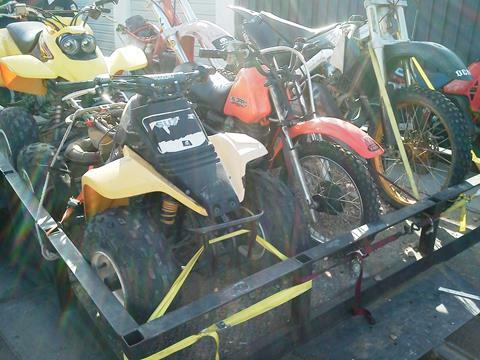 All those items were serialized or had altered serial numbers,” Ruiz said, adding that deputies also seized two quad bikes and three motorcycles. “None of them were registered to him nor could he provide any documentation or proof of who the lawful owners were,” Ruiz said. Willis was arrested for grand theft and jailed in lieu of $35,000 bail. Detectives are now working to identify the rightful owners of the equipment and stolen property. Willis is due in court Thursday to face charges. 10 comments for "Local construction site thief nabbed"
So they dropped all the charges? Where is it okay to go and take something that isn’t yours and then when caught claim you made a mistake and were about to return it? Good luck with that in court. The name of the person arrested comes up under the name of a construction business. Many of the items stolen were items one would use when running a construction business. Either the construction company is a cover for him to sell stolen items from construction sites or there is more to this story than meets the eye. If that Miller welder goes to auction I’m bidding on it. There is more than meets the eye to this story and the only thing that was stolen was the bob cat and everything in the truck and trailer i can tell you when and where and who he got it from. Correction “Reported Stolen” i men’t to say. In stealing that equipment he prevented others from being able to work to feed their families. I do not feel sorry for him no matter how he tried to validate his crime. Those who steal to feed their family do not take excessively. Those who are either a kleptomaniac or supporting a large drug habit will. “Those who steal to feed their family do not take excessively.”? So by your logic, if I have something but you need to feed your family it is alright to steal something from me? If you steal something, you have taken something that does not belong to you. I would consider that excessive “taking”….